Set in the lush countryside of Lexington, KY – The Summit at Fritz Farms is the newest state-of-the-art destination for its residents and visitors. Its open-air layout of shops and courtyards denote a sense of community. And with a curated collection of boutiques, restaurants, Class-A offices and residential neighborhoods, this mixed-use area promises a meaningful experience. Best described, The Summit is a unique blend of Lexington’s sophistication and heritage. The result: people are flooding to it. But during its creation, its management company noticed one glaring issue. The region’s storm-water detention basin, just beyond The Summit’s boundaries, had become not only an eye-sore, but a flood threat as well. Originally, given the frequency and severity of flooding in Lexington, this area had served as a natural detention basin for Lexington’s massive volumes of rainwater. Its expansive space able to accommodate thousands of gallons at a time, before slowly releasing the water into the city’s storm-water system. However, without any strict barriers, the basin now brought the flood hazards of Lexington into the backyard of The Summit’s residents and visitors, multiplying its effects several-fold. To shore up the walls of the detention basin, a retaining wall was designed. As expected, its parameters demanded a cost-effective, flexible and durable product. More specifically, the wall itself would need the shear strength to withstand over 50 tons of back slope. At the same time, its design would need to be authentic enough to complement the aesthetic of The Summit. To complicate the project even further, traditional small block couldn’t be used for most of the wall, as it requires geogrid that would interfere with the utilities behind the basin. Unable to compromise on any of the project details, The Summit’s management company quickly began eliminating their options. Soon, the answer manifested itself: precast segmented block. More specifically – Verti-Block. With its open-core design, Verti-Block would be both lightweight and cost-effective to use. It would also provide essential hydrostatic pressure relief to the water-saturated soil behind the wall, by draining backfill water into the basin through aggregate in the interior of the block. This would not only provide the necessary drainage to loadbearing wall, but provide the block’s needed weight with a much cheaper option: gravel infill. Aesthetically, Verti-Block was the ideal candidate for the project as well. Each block has a deep, molded finish that looks like real rock, and the block design was random enough to look natural when its pattern repeated. This enabled the wall to fit the style of The Summit, a critical feature of the project. Ultimately, this led The Summit’s management company to Foster Supply – a leading construction supply company in Harrodsburg, KY – with their vision for The Summit’s retaining wall. One of the unique challenges that Foster Supply overcame during the building of the retaining wall was the circumstances of the foundation. Because of the location and conditions of the site, the wall would have to be built on the banks of the basin. To lay its foundation, Foster Supply’s team would need to work completely underwater. “We were about ankle to knee-deep in water the whole time,” explained Ron Foster, the project manager. 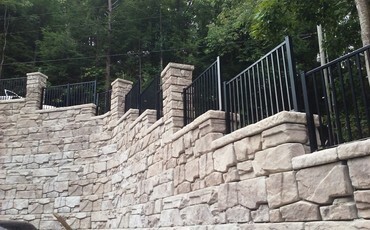 As with other retaining wall projects, this foundation was critical. Not only did it need the bearing capacity to support the rest of the wall, but the base couldn’t afford to sink or shift over time. Ultimately, to compensate for the irregularities of the basin’s rocky banks, Foster Supply laid nearly a foot of gravel under the Verti-Block wall, allowing them to set the foundation firmly in place. The other challenge Foster supply met during the building of the retaining wall was the immense weight of the back slope. As it added several tons of extra dirt behind the wall, friction-reliant blocks would not be enough to withstand the pressure over time. Verti-Block units interlock with an integrated shear lug that secures their connection and sets the proper batter to the wall. This guaranteed that the wall would resist shearing, even with the added measure of the back slope behind it. At the completion of the project in 2017, the 6 retaining walls averaged 12 feet high, with the highest wall reaching 16 feet. To compensate for the towering hill behind them, the walls were organized into a 2-tier system to ensure stability. And, ultimately, due to the enormity of the project, the walls used over 200,000 sq./ft. of Verti-Block. Now, with Lexington’s floodwaters safely secured, The Summit is prepared to handle the continuous floods of people looking for a classy shopping and dining experience.